The following text was contributed by the Government of Croatia. 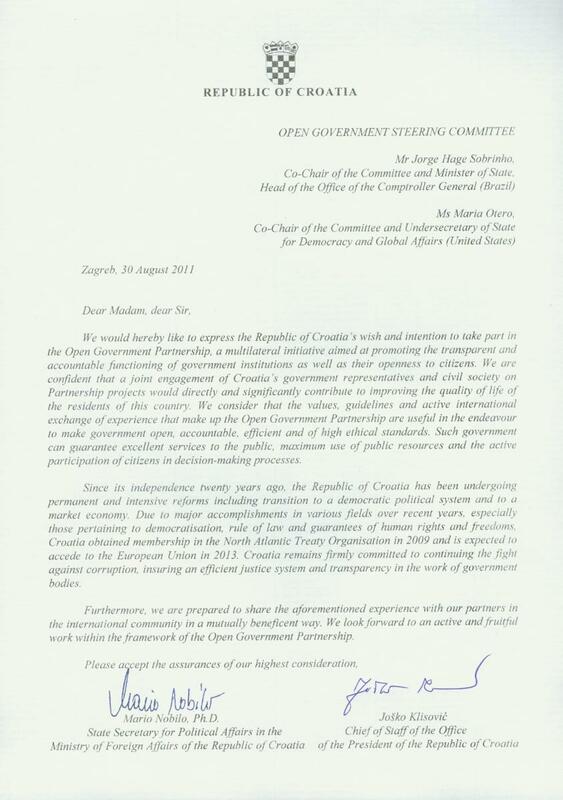 By joining the Open Government Partnership initiative, the Republic of Croatia expressed willingness to support the very same principles and values to which it already committed to during the process of accession to the European Union, namely, through multiannual efforts invested in performing reform and adjustment requests in all areas of social, political and economic life, including transparency, fight against corruption, strengthening enabling environment for civil society development and using ICT for purpose of effective and innovative public services delivery. The development of Croatia's OGP Action Plan was a truly joint effort of government bodies and civil society and involved a series of public consultations, public hearings and in-depth discussions through National OGP Council. The Council is a cross-sector body established to promote partnership approach in developing and monitoring the implementation of OGP. It is composed of representatives of central and local/regional government bodies, civil society representatives (chosen by CSOs themselves), academic community and media. The Action Plan envisages implementation of 9 priority measures and 34 implementing activities, with concrete indicators for measuring the success of measures and activities undertaken in agreed deadlines. Measures and implementation activities of Action Plan are grouped in four priority areas: fiscal transparency, access to information, use of information technologies, citizen and civil society participation. These are the themes that governments have focused on in their commitment development. The IRM has evaluated commitment completion overall. Commitments in this section are part of the government's current action plan. The OGP's Independent Reporting Mechanism may not have reviewed these commitments, so the data available may be limited. Once the implementation period is complete and commitments have been fully reviewed, they appear in the next section. The action plans submitted by the government with the original commitment lists and text are available below. Commitments whose implementation period has been completed and which have been reviewed by the OGP's Independent Reporting Mechanism appear below. Original commitment lists and text can be found in the country's action plans listed below. 9 hours 26 min ago.